SmartAdblock is a new content blocker for Mozilla Firefox and Google Chrome, and compatible browsers. While there are certainly lots of content blockers out there already, including the excellent cross-platform extensions uBlock Origin and uMatrix, it is fair to say that there is still room for improvement especially when it comes to usability and also functionality. SmartAdblock does not reinvent the wheel when it comes to the blocking of ads, but it does add some extra features on top of it that set it apart from the default configurations of other content blockers. The three main features that the browser extension supports out of the box deal with cookie and GDPR warnings, handle adblock detectors on popular websites, and block aggressive popup ads on sites. 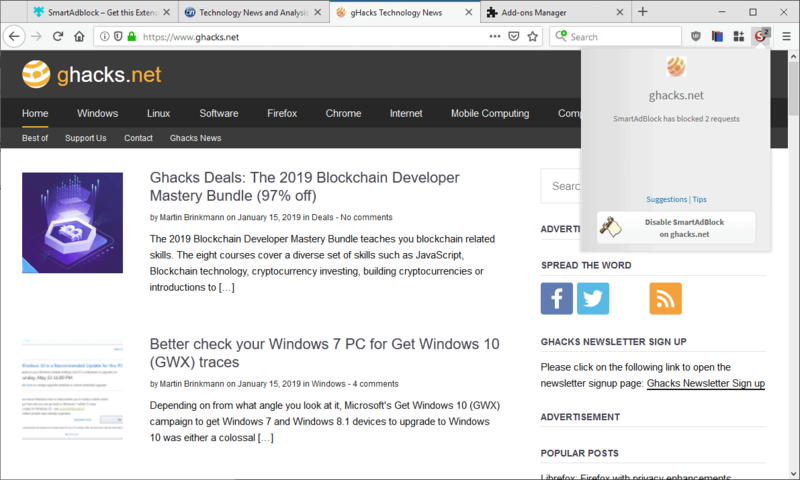 Note: Advertisement is still powering a large part of the Internet and sites like Ghacks rely on the revenue to stay online. Consider supporting the sites that you like and visit regularly. The extension adds an icon to the main browser toolbar. The icon indicates the number of blocked elements on the active page. It furthermore lists an option to disable content-blocking on the active site, and to open the developer website to contact the developer or tip them. SmartAdblock works out of the box; that is necessary, as it does not offer any configuration options besides enabling or disabling ads on a site. If you need more control, e.g. allowing or disallowing certain connections, you need to look elsewhere right now. Options to add custom filters, remove elements visually, and other important features are missing as well at the time of writing. Many sites display notifications or prompts to users when they detect the use of content blockers. Some allow users to continue without disabling the content blocker, others block access until the use signs up for a premium account or disables the content blocker. SmartAdblock bypasses these prompts on a number of popular websites and many more. The extension worked on sites like CNET, Business Insider, IGN, Eurogamer, and Techradar. Site content loads directly and interrupting prompts are not displayed. The bypassing works for many cookie and GDPR privacy notifications as well out of the box. Popup blocking is another specialty of SmartAdblock especially when it comes to aggressive popups used on sites like Putlocker. The blocking worked really well during tests on sites that throw popup ads at users regularly. 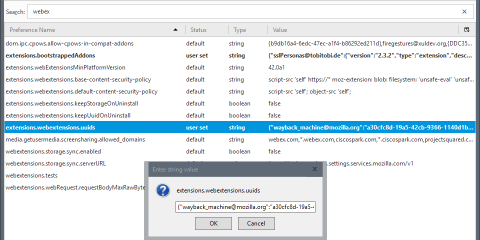 Blocked popups are highlighted in the extension interface so that they may be opened in case of false positives. SmartAdblock is a set and forget kind of adblocker that blocks advertisement well. 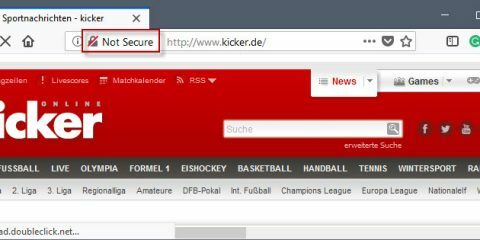 It is the extension’s extra features, the bypassing of anti-adblock and privacy prompts, and the blocking of aggressive popup ads that make it stand out. The developers should consider adding more control over the blocking process to the extension to make it more useful. Also, more options, e.g. custom filters, loading of extra lists, and so on would certainly be appreciated by many users. Now You: What is your take on SmartAdblock? Ghacks needs you. You can find out how to support us here or support the site directly by becoming a Patreon. Thank you for being a Ghacks reader. 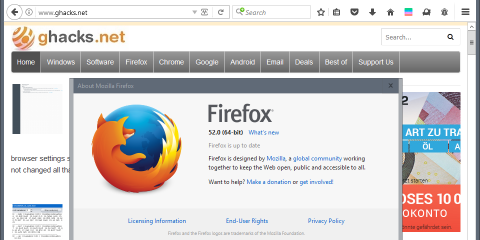 The post A first look at SmartAdblock for Firefox and Chrome appeared first on gHacks Technology News.